Your mail in Ballot should have arrived by now. I first met Barb Haselden in 2013 as she was organizing the No Tax for Tracks initiative. What impressed me the most was it was clear Barb was not a politician or representing a special interest, she was a concerned resident of Pinellas County who foresaw the possibility of a major boondoggle if a sales tax referendum for light rail was passed. Barb tirelessly pursued the goal of defeating the referendum even in the face of withering condemnation from her opponents. Always armed with the facts and not personal attacks Barb led a movement that resulted in the Greenlight Pinellas effort being defeated with 62% of the voters voting no. I had the chance to watch Barb work up close. She is tenacious, relentless is her search for the truth and unafraid to confront the Pinellas County political power structure. Barb Haselden has resided in St Petersburg for 30 years, and specifically District 6 for 25 years, the seat she is seeking in 2018. She founded her Florida corporation Hometown lnsurors, lnc. in 1989. She was a pioneer over the decades for the much-needed long term care insurance product and has personally transacted the placement of thousands of individual long term care policies from major insurance companies to her clients, sometimes their adult children and now even some grandchildren in the same families. She continues as the president. ln 2009, Barb became interested in local government and founded the “South Pinellas 912” group, a taxpayer centered citizen organization, that she has built to nearly 1,000 local members. As the leader of that group advocating for Pinellas taxpayers, Barb has attended hundreds of Pinellas and Hillsborough County meetings (BoCC, PSTA, TBARTA, MPO, etc.) to stay informed on local issues affecting the taxpayers. As a result of attending these government meetings Barb was alarmed when she learned about the Pinellas County Board of County Commissioners plan to put a unnecessary light rail system in Pinellas County and their decision to try to convince Pinellas voters to pass a massive sales tax increase to pay for it. In 2013 Barb created "No Tax For Tracks", a Registered County Political Committee, to educate Pinellas taxpayers about the light rail, which the Board of County Commission called Greenlight Pinellas. During 2014 Barb drove to 200 community meetings at the extreme limits of Pinellas County, to educate voters on how the Greenlight Rail Tax would affect them. She debated numerous Greenlight Proponents at large venues. She gathered supporters countywide who joined in the effort. Nearly 7000 "No Tax for Tracks" yard signs were distributed countywide by citizen volunteers organized thru Barb's leadership. Thankfully, her work paid off and the voter referendum on Greenlight Pinellas was defeated November 4th, 2014, with 62% voting No to the tax increase, which would have raised our sales tax to 8%, the highest in Florida! 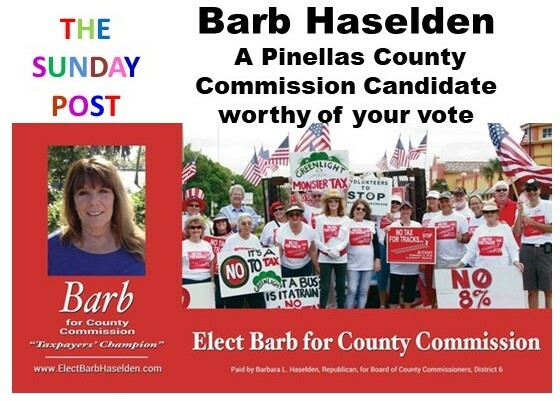 If you live in a Precinct where Barb Haselden is on your ballot for Pinellas County Commission District 6, she is your best choice by far.